A fascinating and relatively unknown topic that I chose to study for my BSc, iridescence is, in its simplest definition, an “optical phenomenon in which hue changes according to the viewing angle”. 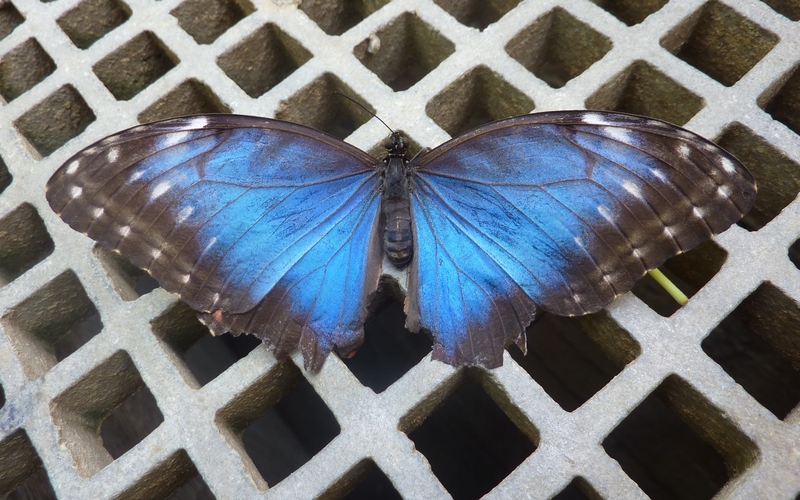 The most obvious example is a soap bubble, but it is also a very common feature in the animal world (such as for this Morpho butterfly). The phenomenon can be observed in most plant groups, but on a limited number of species. 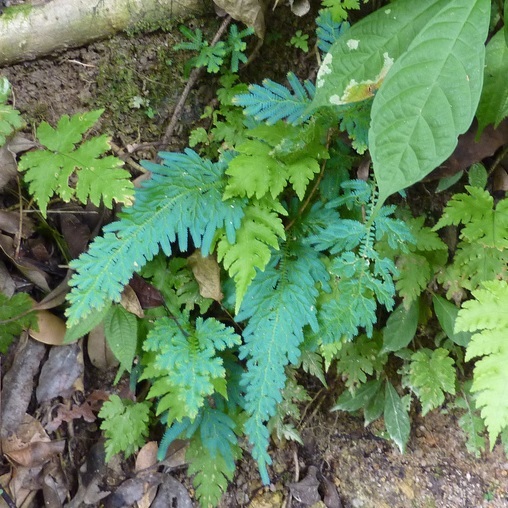 Interestingly, it has been mostly recorded in understorey plants of Asian forests, where the light level is only 1% of the light level in the canopy. This had led to the hypothesis that iridescence could be an adaptation to low light levels…but more about that later! 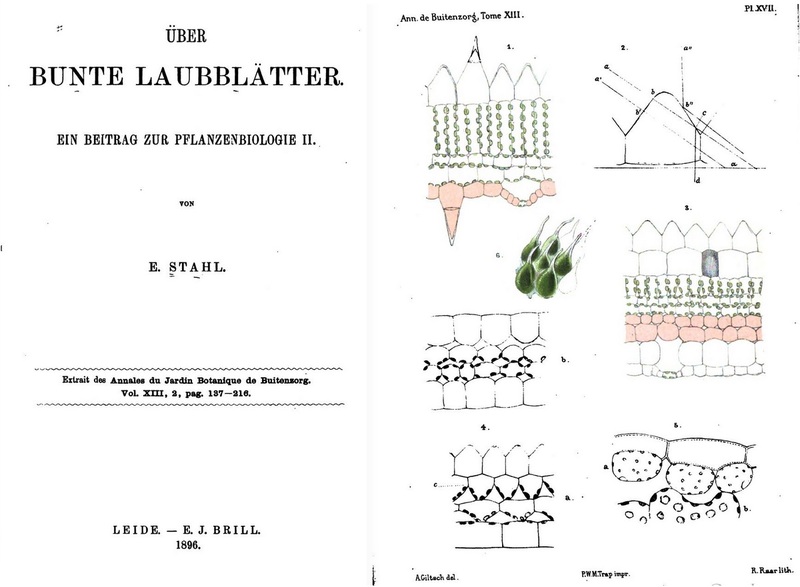 Plant iridescence was first noticed (from what we know, I’m sure there must be accounts of shiny plants in early ages naturalists’ diaries) in 1896, by a German botanist named Ernst Stahl, who traveled extensively to Ceylon and Java. Studying Selaginella wildenowii, he observed “granules” of what could be a reflective pigment in the cuticle. 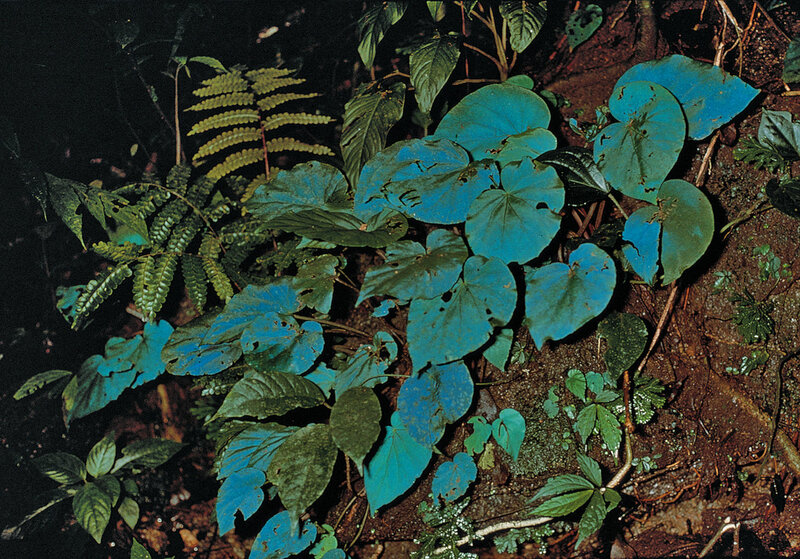 Then, in 1971, Denis L. Fox and James R. Wells observe that iridescence in Selaginella disappears if the leaf is allowed to wilt or if the leaf is wet – because small airspaces on the leaf surface get filled with water. They emit the hypothesis that iridescence is (at least in Selaginella) an optical phenomenon. 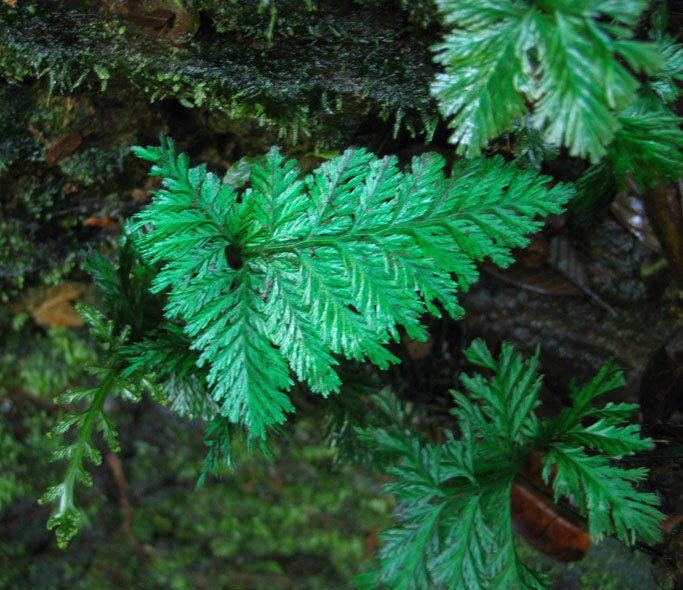 In 1975, a study by Malaysian researcher David W Lee finds no iridescent pigments in the leaves of Selaginella, which confirms the hypothesis of an optical cause to iridescence. I’m afraid I have to go into some physics now (but hey, who said botany was easy? 🙂 ). Normal leaves appear green because they reflect mostly green light. Blue leaves will appear blue because they will reflect mostly blue light. But how is that possible? 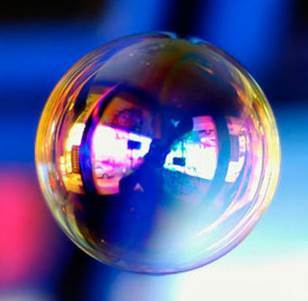 The mechanism behind this is called thin-film interference. 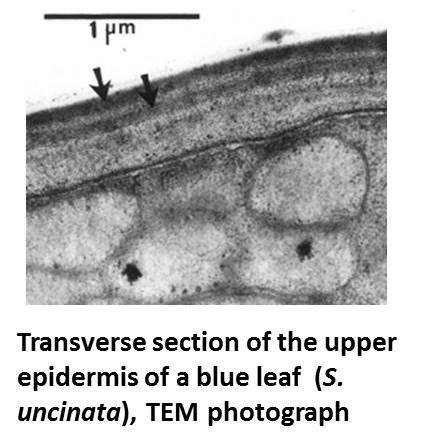 Imagine the blue layer is a leaf, with A and B two rays of light. Ray A is reflected on the bottom surface, ray B on the top surface. The light that gets “reflected” will be a mix of ray A and B. 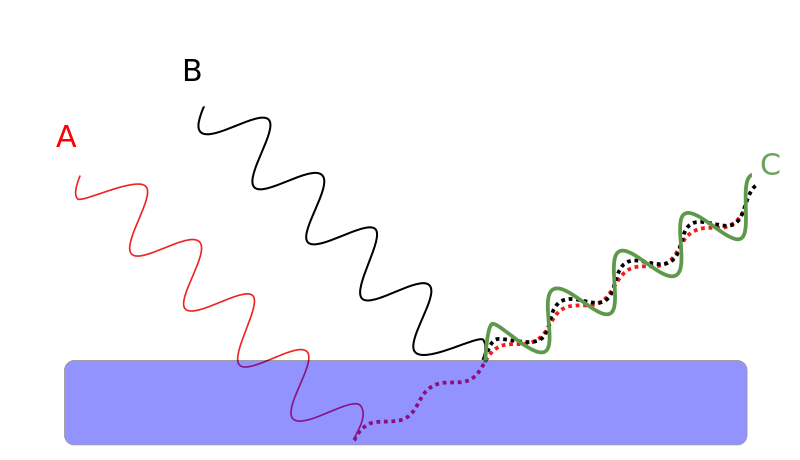 If the two rays have similarly shaped curves (their wavelengths are “in phase”), they will add up and produce a very intense reflection (constructive interference). On the other hand, if the rays have opposite curves, they will cancel each other and produce almost no reflection (destructive interference). 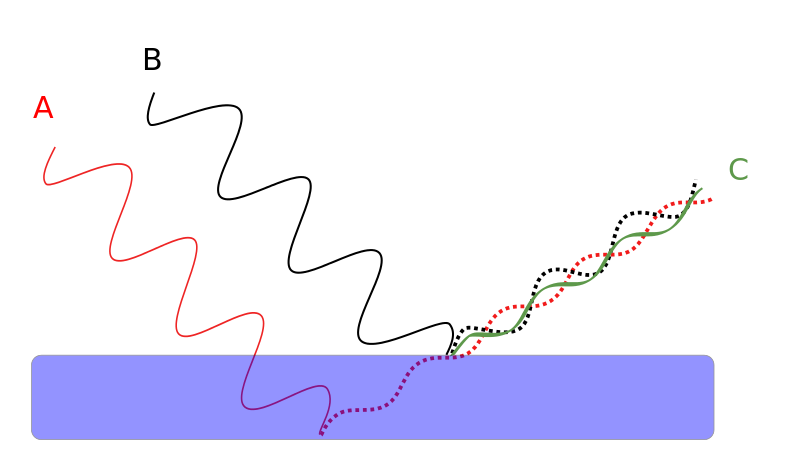 How the rays are reflected and at which angle depends on the thickness and density of the blue layer (air being very different to oil for example!). How do plants produce iridescence? Plants use various mechanisms to play with these factors. 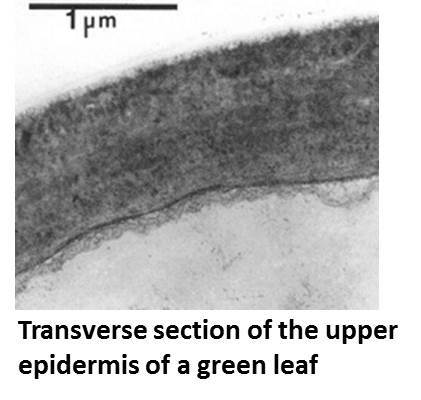 For example, if you look at these microscope pictures of Selaginella leaves, you’ll see blue leaves have bizarre layers in the cuticle (waxy surface of leaf), which act as light filters! 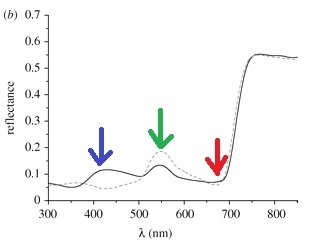 The graph shows that blue leaves reflect a lot more blue light (around 415 nm), a lot less green light (around 550 nm) and around the same amount of red light. If you’ve had even just one course on photosynthesis, you’ve probably learned that red and blue are the best lights to make chlorophyll happy. So why would plants living in shade go without efficient, blue light?? 1) A sacrifice of blue light to increase photosynthesis? According to this hypothesis, iridescent plants would “sacrifice” blue light to be able to capture more red light. However, if you look at the graph above, this is clearly not the case. Moreover, blue light is as important to photosynthesis as is red light. The idea is that iridescence could confuse herbivores, or make leaves look like non-food, unrecognised targets in a “scarecrow effect“. This would offer them a competitive advantage over other shade plants, in spite of their limited photosynthesis ability. 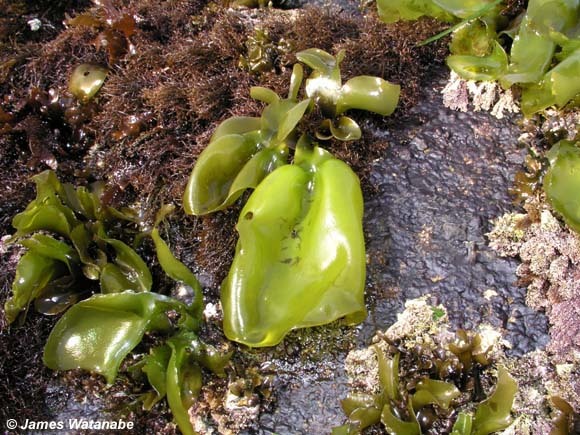 The only observation of this has been made in an iridescent algae, Mazzaella flaccida. Most iridescent plants are adapted to live in deep shade. If such plant is placed into a high light environment, photoinhibition will occur, damaging chloroplasts, and sometimes leading to wilting. Iridescence would protect plants from damage in case of accidental exposure to high UV light, for example in case of a tree fall. 4) No role at all? An interesting possibility. However, notes on cultivation of some species show that iridescence tends to disappear or be attenuated if the plant is grown in a less shady environment. This strongly suggests that iridescence has an adaptive role in plants! And think about this quote from David Lee’s 1977 article: what if iridescent plants had a role to play in the future of mankind? !